Twitter Cards allow you to attach link previews with photos and link titles to your tweets. Summary Card: Title, description, thumbnail image, and Twitter account attribution. To learn more about adding Twitter Card meta tags to your website, please see Twitter's Getting Started Guide. First, install the WordPress SEO by Yoast plugin. Click on the Social settings under the menu. Click on the Twitter tab. Check the Add Twitter Card Meta Data option and input your Twitter username. Select The default card type you want to use and save. 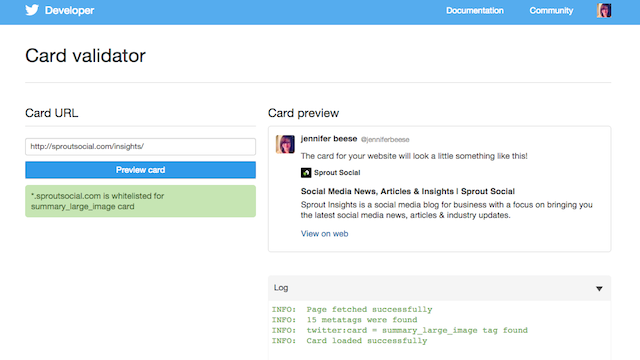 Double check that your Twitter cards are working with the Twitter Card Validator. If you run into errors when validating your links, check out Twitter’s Troubleshooting Guide.